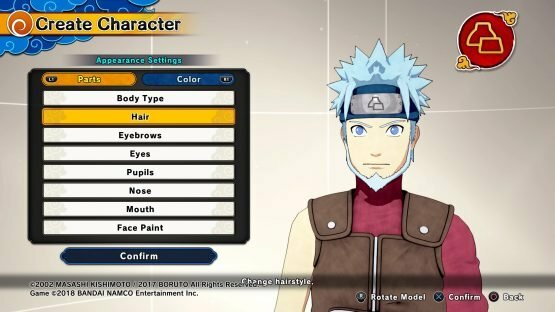 Naruto to Boruto Shinobi Striker Collectibles Guide - Unlock Everything! Do you want to become the coolest shinobi in town, have a varied arsenal of ninja weapons or just unlock your favorite Master? Follow this guide, in which I will explain the ways of getting Ryo (in-game currency), scrolls (lootboxes), and experience. There are hundreds of items and cosmetics to purchase. It will take time but luckily not much skill or luck. 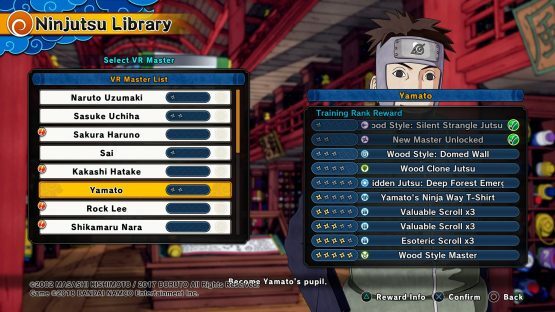 Let’s go and unlock everything in Naruto to Boruto: Shinobi Striker! The most important thing you need to learn about Ryo is that you only get it from missions. There is no point in playing PvP (player vs player) if you are planning on farming some gold, because you won’t get any from defeated rivals. Ryo appears when you beat IA enemies during the VR Missions. You don’t need to hurry and pick the coins quickly because they won’t go away unless you finish the objective. The first tasks—Rank D—won’t give you much, but as you complete more and more missions, you will unlock higher ranks, which will provide you with considerable amounts of gold. Just pick whichever you find simple and start farming some nice Ryo. Once you have farmed Ryo, you can go to Tenten’s shop and start buying items. Titles, clothes, weapons, and accessories can be bought with this currency, and you will need loads of money to buy them all. However, every time you earn a scroll, you will get a random item, sometimes more than one, and also money. Scrolls can be gained by leveling up your character, your VR Master, or by finishing matches and certain missions. Check out the “reward” description on the bottom of every mission to know if you could get one. I wrote “could” instead of “will” because the drop depends on RNG (it’s random, you don’t know for sure if one will actually drop). However, you can repeat any mission as many times as you wish, and in the process you will still be earning Ryo and experience. There are different types of scrolls, from regular ones to “Kakashi Scrolls.” Each type has an specific drop rate of rare items, and Kakashi Scrolls are the ones with the highest percentage of dropping great items. You can buy scrolls with Ryo, too, but I don’t recommend it as they are quite expensive. It’s much better to just play and level up, leaving the money for buying actual items and not the lootboxes. Please. Learning experience in this game isn’t really difficult, because you can win a good amount of it even if you lose. Experience depends exactly on how many points you receive after any battle. The results chart will give you a detailed description of where all the points come from. The usual suspects are here: how many times you have died, the number of enemies you’ve beaten, how fast you finished the mission, etc. 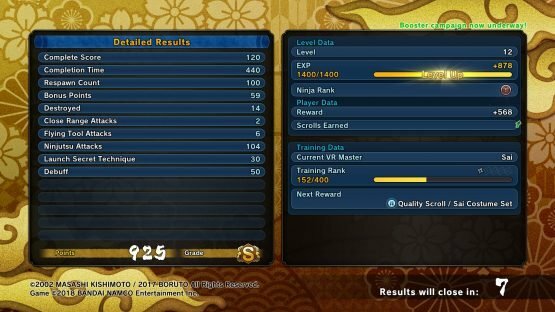 You also get points from using Secret Techniques, Ninjutsus, ranged attacks, etc. 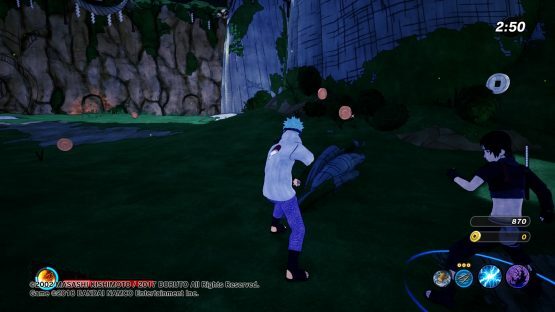 Overall, you could get more experience from playing PvP than PvE (Player vs Environment), but there are some really basic missions that can be completed in a couple of minutes, like the first time you protect the Leaf Village from hordes of monsters. Never quit a game, even if you know you will lose from the very beginning, whether it’s due to lag, rage quits, or whatever. As I mentioned before, you will get exp either way, but if you exit a current match, you won’t win anything. It will be a completely waste of time. There are twenty VR Masters to unlock. Luckily, they are pretty simple to obtain, there are only two different ways. Some of them require to level up a Master you have chosen to lvl 2—check the info reward. It doesn’t take much time; you will get there after a couple of matches completed. The second way is to finish some specific missions. You will notice that at the beginning you only have a small number of them unlocked. To obtain the rest, you need to speak with the series characters around the lobby. When they have a task for you, a red exclamation point will pop up above their head. Complete all the quests, and you will be rewarded with more missions and some Masters. When you finish with an NPC, another will appear somewhere. If you can’t find any, restart the game or go back to the main menu. There is a bug that interferes with characters’ appearance, but is easily fixed by restarting the session. After speaking with all the NPCs and doing all their tasks, the rest of the missions will be automatically unlocked.